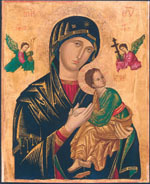 Our annual online novena in preparation for the Feast of Our Mother of Perpetual Help begins June 18. We invite you to join us as we pray for the needs of ourselves and our world. Each day during the novena you’ll find on redemptorists.net a short explanation of part of this famous Byzantine icon, along with a short prayer. During the novena, feel free to send us your specific prayer intentions on our Prayer Requests page.